Spiders have eight legs, arranged into four pairs. Each leg has six joints, giving the spider 48 leg joints in total. In most spiders, the legs are so thin that the joints are not immediately visible to the naked eye. 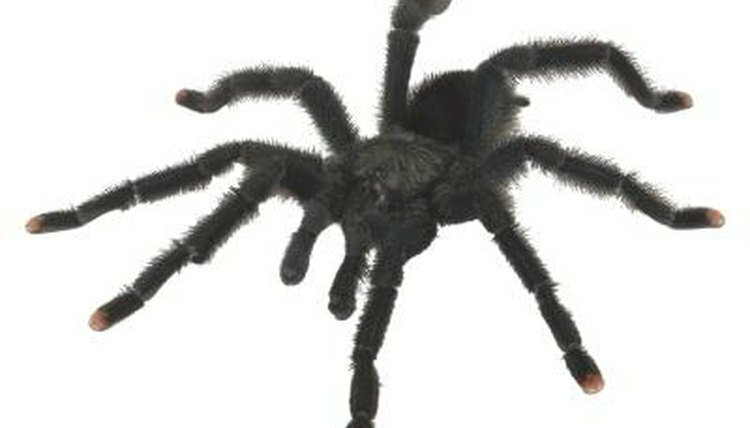 In larger spiders, such as tarantulas, the size of the legs makes the structure and constituent joints more visible. The leg joints are a crucial evolutionary adaptation of the spider and its many arthropod relatives. The shape and structure of the spider’s leg is distinctive. At its highest point, the leg is elevated above the body of the spider. The leg joins the body at the coxa. From there, the leg position ascends to the next joint, the trochanter. This joint is connected to the femur, the broadest and strongest part of the spider’s leg. The femur extends upward to the patella joint. The patella is analogous with the knee seen in bipeds and quadrupeds. The tibia, the longest part of the spider’s leg, extends downward from the patella, toward the metatarsus section, where it is connected by a small intermediate joint. The final section is the tarsus, which connects to the claw. The development of jointed appendages was a natural evolutionary milestone. Arthropods, a group that includes spiders, crabs and lobsters, are characterized by their jointed legs. Without joints, animals with hard bodies and spines would not have been able to move. Arthropods are the most species-diverse group of organisms known to man and make up 75 percent of all living things on Earth. Spiders are able to jump due to an evolutionary adaptation that enables them to build pressure in their joints, in a similar way in which machinery uses hydraulics. Spiders can flex their joints. In flexing the joint, they allow fluid to enter, which increases the pressure inside the joint, enabling them to use their legs as a natural launch pad for jumping. When spiders die, this function stops and the legs immediately curl up. Another impressive adaptation of spider leg joints is the fracture point between the coxa and trochanter. If captured or trapped by a predator or rival spider, spiders are able to quickly detach their leg from the rest of the body. This fracture point is adapted so that bleeding and trauma is minimal, enabling the spider to make a swift getaway from any hazardous situation. Are Spiders Vertebrates or Invertebrates? Where Does a Horn Spider Live?